Stele with a standing ithyphallic image. 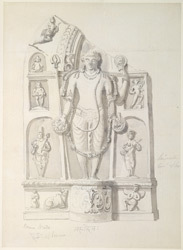 17-20 December 1789.
bl.uk > Online Gallery Home	> Online exhibitions	> Asia, Pacific and Africa Collections	> Stele with a standing ithyphallic image. 17-20 December 1789. A stele is an upright inscribed slab or pillar used as a gravestone. This image was probably originally a Harihara, since Garuda and Nandi are both in attendance below, but the artist has not differentiated the two sides of the image, while the attributes are unclear apart from a 'trisula' and a 'cakra'. The Daniells seem to have seen this image near the remains of the Benimadhava temple beside Aurangzeb's mosque above the Panchganga Ghat in Varanasi, uttar Pradesh.